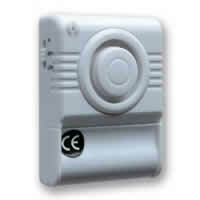 GG-01 Glass Guard Window Siren Alarm. vibration / shock sensitive also suitable for protection of individual items of property against unauthorised movement. 4) The unit can be used as a personal property alarm to protect computers, TVs and videos. 5) Effective, low cost vibrationand shock sensitive alarm that can be used for securing windows and patio doors.